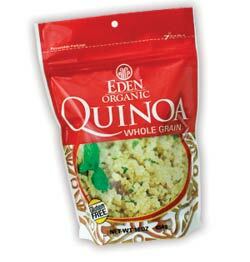 Clinton, Michigan - Eden Foods has repackaged its whole grain Organic Quinoa in a new reclosable, 16 ounce, standing pouch. The new package provides improved convenience for consumers and friendlier merchandising for retailers. Eden Organic Quinoa is a quick cooking, gluten free, whole grain food. It is organically grown on small family plots high in the Andes Mountains, at over 11,000 feet altitude. This high altitude produces the most sought after nutrient dense quinoa, and larger quinoa grains. Eden has worked with a handful of Andean farmers since the 1980s helping them to convert to sustainable, certified organic methods of growing and producing quinoa. One example is the Angula family farm in Imbabura, Ecuador. Here at over 12,500 feet altitude is "the richest soil I have ever seen," says Eden Purchasing Director Jon Solomon. The topsoil, teeming with earthworms and other organic life, is nine feet deep in many areas. Eden Quinoa is also distinguished by the way it is handled after harvest. All quinoa seed has a natural coating of saponin, a waxy, soapy tasting substance that must be removed before the grain is ready for cooking. The common method to remove saponin is to soak and wash excessively with water. Instead, Eden Quinoa is mechanically desaponized; the saponin is removed by rubbing. This superior method best preserves quinoa's flavor and nutrients. Quinoa (pronounced KEEN-wah) is not a true cereal grain but a member of the goosefoot family. However quinoa is considered a whole grain food. It has the best amino acid profile of any grain, including lysine and threonine, rarely found in cereal grains. It contains all essential amino acids, making it a 'complete' protein. As a gluten free food quinoa can be enjoyed by most people who have allergies to other grains. The American Celiac Sprue Association lists quinoa as "consistent with a gluten free diet at this time." The Canadian Celiac Foundation also lists quinoa as an allowed food on a gluten free diet. The quickest cooking whole grain, quinoa is ready in 12 minutes. Each round grain, about the size of millet, is bound with a narrow germ. When cooked, the germ separates from the seed and its delicate, almost crunchy curlicue complements the soft grain. Eden Organic Quinoa is an excellent source of dietary fiber providing 11 grams or 44% daily value per serving. It is a good source of iron, vitamin E, riboflavin (B2), pyridoxine (B6), magnesium, and zinc; very low sodium, and saturated fat free. Best of all it has the fluffy texture and sweet nutty flavor sought after by quinoa lovers everywhere. Use Eden Organic Quinoa as you would rice, as a side dish, the base of a delicious salad, as a quick wholesome snack or breakfast cereal. Add it to soups, stews, and chilis. Visit www.edenfoods.com/recipes for more than 800 free recipes including dozens of delicious quinoa creations. Eden Organic Quinoa is kosher parve. The suggested retail price is $3.79 per 16 ounce pouch. It is also available in 25 pound bulk size.